Do you see the microphone built into your laptop? No? That’s because it’s incredibly tiny, and probably sounds equally unimpressive. 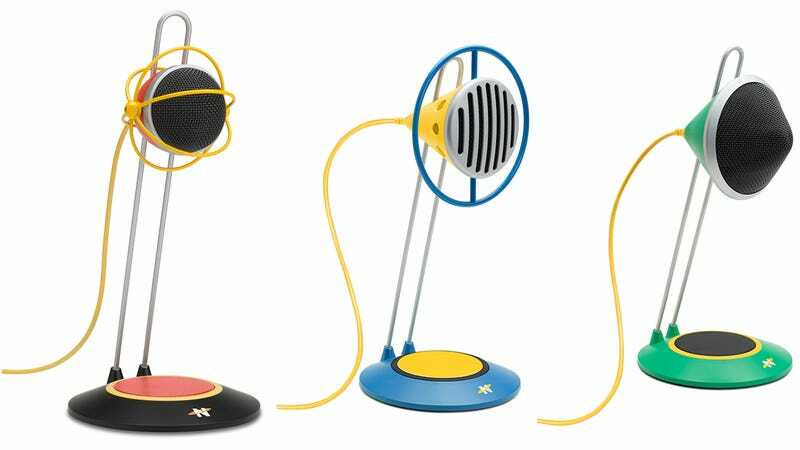 Gibson’s Neat Microphones brand wants to change that with a trio of colorful new mics that promise to make you sound better on your next Skype call or podcast. The new line of mics, dubbed the Widgets, come in three different retro-futuristic designs that look like they were taken from the desk of Edward R. Murrow, were he some kind of time traveler who’d just returned from a far-off date. And that’s a good thing, because you won’t mind them hanging around your desk when not in use. They almost look like a series of ultra-modern but functional sculptures. The Widget ‘a’, ‘b’, and ‘c’ mics (the green, red and blue model, respectively) all feature adjustable height shockmounts, a pop filter to help minimize sudden jumps in volume, and a simple USB cable so they can be easily connected directly to your computer without the need for a pre-amp, adapters, or a messy break-out cable. The three Widget mics will hit stores like Best Buy, Walmart, and Amazon starting on November 15 for $99 each, and since they’re all sonically the same, your decision will come down to which one you think looks the coolest.